Glasgow head coach Gregor Townsend says his side's attacking mindset was integral to their six-try European Champions Cup win over the Scarlets. Warriors' 43-6 home victory lifts them off the bottom of Pool 3, five points behind leaders Racing 92, who thumped Northampton 33-3. But, despite the good win, Townsend believes his side had to "dig deep". 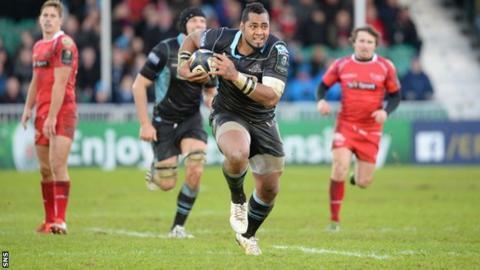 "When it went to 10-6, it showed what a tough team Scarlets are to break down," Townsend told BBC Scotland. The Warriors led by only seven points at half-time, having failed to capitalise on several scoring opportunities, while the imposing figure of Australia winger Taqele Naiyaravoro, who would go on to score a hat-trick, had a spectacular try disallowed. "At that time, I thought we were playing well and we had opportunities, but the passes weren't sticking," Townsend said of the first half. "We needed to play better and we did in the second half. "The pressure told and I thought we played very well. "The collective mindset of always taking the game to Scarlets and the discipline were the key factors in our win." Townsend was full of praise for Naiyaravoro, 24, a summer signing from the New South Wales Super Rugby franchise, the Waratahs. "An excellent performance," said the head coach. "He ran hard on the ball and is a difficult man to tackle. "He's played pretty well since he's come here. I think he's scored a try in every second game. "At times, it's been difficult getting the ball to him, but he's a danger. We've got to make sure the players inside him are making the right decisions on whether to pass or take the line inside themselves." Having lost their opener at home to Northampton, Glasgow now travel to Llanelli to face Scarlets again next weekend. And, despite saying his players will have been buoyed by Saturday's emphatic win, Townsend says they still have it all to do to qualify for the knockout stages. "We've got four games left, three of them away from home against teams leading their own leagues," he cautioned. "It will be tough, but the players will have got a lot of confidence from today. "We'll have to play better next weekend at Scarlets as they have an excellent home record, but if we do then we are right in this competition."